Barbara Gordon, wearing a ninja-suit disguise but not her Batgirl suit, holds her boyfriend Ricky, who is starting to bleed out as a result of a gunshot wound from Barbara's father. The rest of the police tell the gang members to surrender, and most of them do, but Barbara refuses to be captured. She smacks the cops around long enough to escape. After she gets away, Detective McKenna finds her, but McKenna seems to know who she is (whether that means McKenna knows the masked girl is Babs or Batgirl is unclear, as is whether McKenna knows that Babs is Batgirl). McKenna tells Barbara that Knightfall is behind everything. After getting some much-needed sleep, Barbara goes to the hospital to see Ricky, and learns that he is in a coma. She finally decides to go see her father, but before she can get there, Knightfall's minions invade his house and capture him, preparing to kill him. When Barbara arrives and recognizes what's going on, she decides to become Batgirl one more time, to save her father. Gail makes good use of the supporting cast as well, in this issue. Batgirl is one of the few series with a fairly consistent and strongly drawn group of side characters, like Alysia and Ricky (although of course, Ricky doesn't really do much except bleed in this issue). We also see Ricky's mother again, and I hope that Ricky will pull through and his mother and brother will become regulars. Batgirl needs to have some nice, normal people in her life. Again, some of this will depend on whether the editors allow Gail to do this, in addition to whether Gail herself is so inclined. But hey, I can hope. The only blip in this issue is the scene with Mirror. I'm not sure what to make of that. Mirror was the first villain Batgirl went after in this series, and he was probably the best so far. But in that series, Mirror was doing things of his own volition, for his own psychotic reasons. In this issue, he appears to be a pawn of Knightfall, and that doesn't really fit for Mirror. How did Knightfall get control of him, and more importantly, why is he working for her? This doesn't seem to fit Mirror's profile as someone who is just trying to kill the people he thinks don't deserve to live. Pasarin's art in this issue is decent, but I still miss Adrian Syaf. Although Pasarin does a good enough job with action sequences, Syaf's layouts were far superior, and I just liked the way he drew Barbara better. Pasarin's Barbara looks a little too tall and skinny to me. The artwork on the whole is not terrible... but it lacks the distinctiveness and originality of Syaf's work. I really wish they would get Syaf back. Overall this was another fine issue from Gail Simone, whose writing I continue to enjoy on this series. There is one major annoyance, however: The next issue (25) is not going to be the 3rd and final part of the Wanted story arc. DC is interrupting it to include a "Batman Year Zero" crossover. 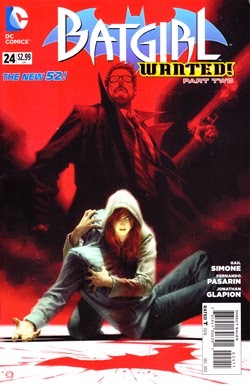 Then, presumably, Wanted concludes in issue 26. It's bad enough they have to do these non-stop events and crossovers, but do they have to interrupt the ongoing story arc every time? We already had a one month gap between parts 1 and 2 because of Villain Month. And now we get another gap thanks to Year Zero. To add insult to injury, although she had a story ready to go, according to Gail, she is not going to be writing the Year Zero story. So I almost might as well not get it. (In fact, if it weren't too late to change my pull list for next month, I very well might not.) I just want to smack someone at DC when they do stuff like this. That has no effect on the story in this issue, however, which was solid. My score: 9/10.